RawTherapee in Single Editor Tab Mode - Vertical Tabs, showing: 1- Main sections: File Browser (currently opened), Queue, Editor and Preferences. 2- Panels used for navigating to files and folders. 3- Thumbnails of the currently opened folder. 4- Filters to limit the thumbnails shown to only those which match some metadata or state. 5- Thumbnail zooming and info. 6- Quick image operations. 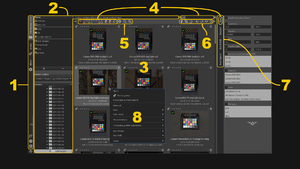 7- Sub-tabs of the File Browser: Filter (currently opened), Inspect (to see a full-sized embedded JPEG preview), Batch Edit (to apply some setting to all selected images) and Fast Export (low quality and bypasses some tools but fast saving - don't use this for typical saving!). 8- Right-click context menu (you will typically use this to apply some processing profile to all selected files). The "Places" panel on the top links to your home folder, USB card readers, the system's default "photos" folder, or custom folders. Below this is a standard tree-type file browser that you can use to navigate to folders containing your photos. RawTherapee does not complicate things by requiring you to import photos into databases as some other software do. The "Filter" tab lets you show only photos which match the parameters you specify. The "Inspect" tab shows a preview at a fixed scale of 100% of the image your mouse cursor is hovering over, which is either the largest JPEG image embedded in the raw file, or the image itself when hovering over non-raw images. The "Batch Edit" tab allows you to apply tool settings to the selected image or images. This allows you to quickly enable some tool in many photos at once. The "Fast Export" tab lets you quickly process the selected images by bypassing certain tools even if they are enabled in the processing profiles of those images, so that you can get a quick preview of the raw files for example to delete the shots which are blurry or out of focus. The central panel shows thumbnails of the folder currently selected. You can hide the individual panels using the "Show/Hide the left panel " and "Show/Hide the right panel " buttons - see the Keyboard Shortcuts page. When you open a folder, RawTherapee will generate thumbnails of the photos in that folder in the central panel. The first time you open a folder full of raw photo files, RawTherapee will read each file and create a thumbnail based on the embedded JPEG image (every raw photo has an embedded JPEG image, sometimes even a few of various sizes). This can take some time on folders with hundreds of photos, but it only happens the first time you open that folder. All subsequent times you go to a previously opened folder, RawTherapee will read the thumbnails from its cache if they exist, and this will be much faster than the first time you opened that folder. The JPEG image embedded in each raw photo is identical to the out-of-camera JPEG image you would get if you shot in JPEG mode (or in "RAW+JPEG" mode). This JPEG is not representative of the actual raw data in that photo, because your camera applies all kinds of tweaks to the JPEG image, such as increasing the exposure a bit, increasing saturation, contrast, sharpening, etc. After you start editing a photo, its thumbnail in the File Browser tab is replaced with what you see in the preview in the Editor tab, and every tweak you make is reflected in the thumbnail. The thumbnails are stored in the cache for quick future access. If you want to revert to the embedded JPEG image as the thumbnail, then right-click on the thumbnail (or selection of thumbnails) and select "Processing Profile Operations > Clear". Use the zoom icons in the File Browser's top toolbar to make the thumbnails smaller or larger. Each thumbnail uses some memory (RAM), so it is advisable not to set the thumbnail size too high ("Preferences > File Browser > Maximal Thumbnail Height"). Show only photos with a NEF extension. If your screen's resolution is too low to fit the whole toolbar, some of the toolbar's contents (buttons, drop-downs, etc.) may become hidden. To see them, simply hover the cursor over the toolbar and use the mouse scroll-wheel to scroll the contents left and right. As RawTherapee is a cross-platform program, it has its own trash bin, independent from your system one if you have a system one. To move files to the trash bin, either use the "Move to trash" button in the top-right corner of each thumbnail, or right-click on a selection of files and choose "File operations > Move to trash". These files are then marked as being in the trash bin, but they are not deleted from your hard drive. To hide all files which are marked as being in the trash bin, click the "Show only non-deleted images" button in the top toolbar. To see the contents of the trash bin, click the "Show contents of trash" button . While you are viewing the contents of the trash bin a new "Permanently delete the files from trash" button appears to the left of the thumbnails - use it to delete all trashed files from your hard drive. Click on the "Clear all filters" button to return to the default view. To delete files from your hard drive without using the trash bin, just right-click on a file or on a selection of files and choose "File operations > Delete" or "Delete with output from queue". Both options delete the selected photo and its sidecar file from your hard drive, but "Delete with output from queue" also deletes the saved image whose filename matches the template which you currently have set in the Queue tab, in the "Use template:" field.